I just finished canning a batch of salsa that I thought turned out pretty good so wanted to post the recipe for my own future reference as well as for others who may be looking for a good salsa recipe. My mom makes an insane amount of salsa every year and plants a crazy amount of tomatoes and peppers in her garden. 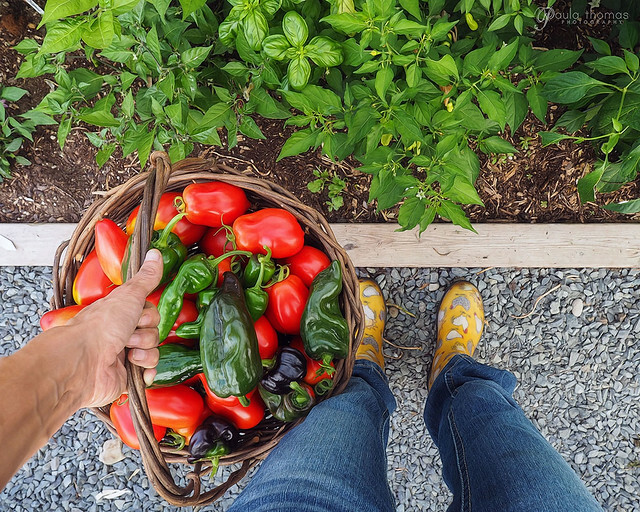 Unfortunately a flash flood followed by a hail storm destroyed her garden this year before she could even harvest any fruit for her salsa. I plan on sending her some of mine though it won't be able to replace all the salsa she would have made this year. I like my salsa chunky and hot but not deadly and this recipe is just that. I hope she likes it. I grew 22 varieties of tomatoes in the garden this year. I chose to use only paste tomatoes for the salsa since they are the meatiest and have the lowest water content. I grew two varieties of paste this year and used half of each for this recipe. Martino's Roma is your more traditional roma and the plant is very productive. Ardwyna is a much larger paste tomato than any I've ever seen and even meatier than the Martino's Roma. Some of the ardwyna tomatoes had a little green on the tops while the rest of the tomato was ripe. The size of these tomatoes gives it the real advantage for making sauces and salsas since they require much less prep work. I harvested some that were around 1lb which is the size of a beefsteak. Will definitely grow them again next year. I chose 4 of the 10 varieties of peppers I grew in the garden for this recipe. I was introduced to padron peppers at Delancey, a pizza place in Seattle, that has a seasonal padron pepper pizza. It has a nice flavorful spice. I got my hands on some padron pepper seeds in a seed exchange this year and was excited to grow them myself. Will definitely grow these every year. They are a little spicier than a jalapeno and have a better flavor too. I also used jalapenos which everyone is familiar with. The variety I have is a larger variety that has big seeds so I decided to deseed it for this recipe. I also used a couple of poblanos which are a mild pepper but have a nice flavor, especially when roasted. I added a small purple bell pepper which I don't think added much flavor to the salsa but it was ripe and ready so I tossed it in. I didn't think the salsa was quite hot enough so I added some cayenne pepper that I dried last year. I have some spicier peppers in the garden (habanero and scotch bonnet) but unfortunately they aren't ready to harvest yet or I would have used those to make it spicier. 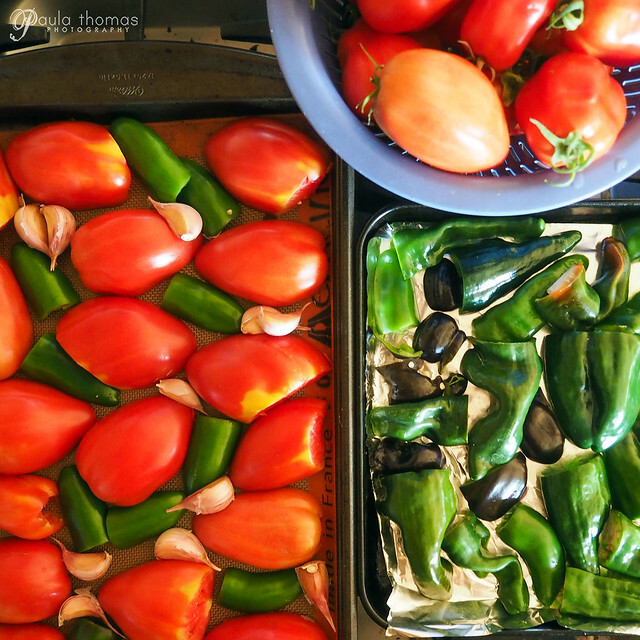 Cut tomatoes and peppers in half and place skin side up in a single layer on baking sheet. Add sliced onions and 24 of the unpeeled garlic cloves to baking sheet and broil for 8 -10 minutes, until skin starts to blacken. Will likely need to do in a couple of batches. In batches, add 3 cloves of raw garlic, peeled roasted garlic, tomatoes, peppers and onions (leaving juices in pan). Pulse until desired consistency. While water bath canner is coming to a boil, add processed fruits and vegetables to a large sauce pan along with cumin, salt, lime juice and lemon juice and bring to a slow boil. You can also let the mixture sit and strain off more of the liquid to make the sauce thicker. Taste and add cayenne pepper to increase spiciness to desired level. Clean half pint jars and add to water bath canner for at least 5 mins to sterilize. Fill jars with salsa, leaving 1/2" space, add clean lids and rings and add to water bath canner. 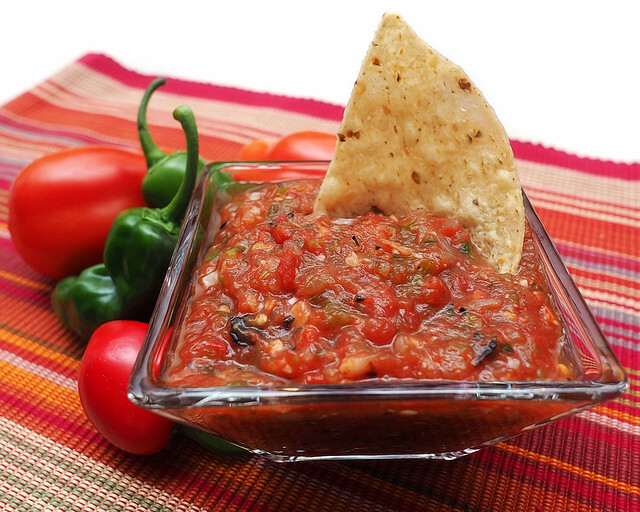 Refrigerate any reamining salsa.